This photo is taken in the 1860s at Haase & Comp. in Berlin. It shows Friedrich I. 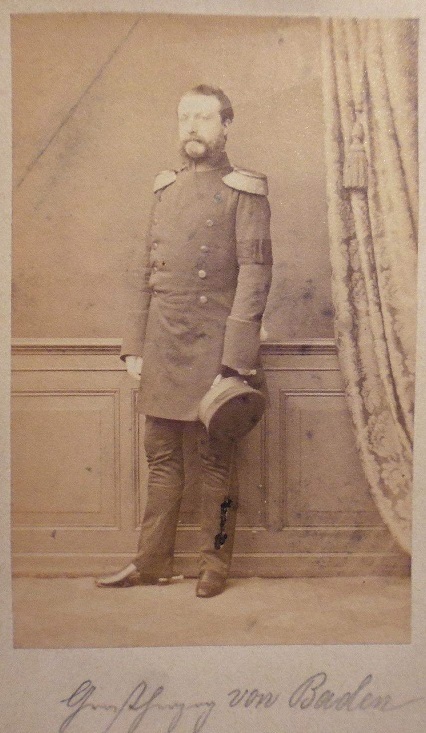 Grand Duke of Baden. He is wearing a black armband (Armbinde). Why? I know that the Prussian and Austrian soldiers wore an armband in the German-Danish War, to mutually recognize each other - only this was white. First welcome to this forum. I believe this to be a mourning band ( Trauer Flor) worn by the Grossherzog. Probably a member of the family died and an official mourning period had been established or practice of that point in time stipulated the wearing of such a band for a certain time. Thanks for showing the picture. Thank you for your response Bernhard. The reason for the mourning band could be the death of Friedrich Wilhelm IV. in 1861. The grand duke of Baden was very close to the Hohenzollern family. He was the son in law of Wilhelm I. king of Prussia and later the German emperor.